I'm sure that, by now, many of you are aware that the UN has declared 2009 The International Year of Natural Fibres. The purpose of this declaration is to raise awareness of natural fibres, their place in a sustainable environment and the natural fibre industry around the world. For the next year, I will endeavor to post useful information and useless trivia that will broaden your understanding of the fibres we work with, and some of the more obtuse fibres, as well. This will be, by no means, a comprehensive study, nor will it be conclusive, but rather and overview from my experience and reading over 25 years of knitting, spinning and weaving. While many people refer to any yarn as "wool", wool is actually the hair of a sheep. Wool is probably the most commonly used fibre for spinners and knitters in North America, Great Britain, and Europe. This is because it is readily available, easy to spin and knit with. and well-suited to the climates of these areas. But to say that something is "wool" is like saying something is "blue". There are over 250 recognized breeds of sheep around the world, each with different fleece characteristics. And not all sheep are created equal--while all sheep produce a fleecy coat, not all fleece is suitable for use in textiles, and those that are suitable fit a wide range of uses and techniques. So how do we know what it means when a label says "wool"? Let's start with the basic structure of a wool fibre. 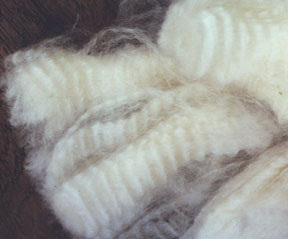 Wool is a protein fibre, comprised of the same molecular structure as human hair. Like human hair, wool grows from a follicle on the skin, with the root end being thicker than the tip end, as there are more cells closer to the follicle. To save you the eyestrain of trying to read the tiny print, the centre hollow core of the hair is called the medulla, and this is one of the reasons that wool has such good insulating properties. The next layer out is referred to as the cortex and is comprised of tiny, densely packed round cells. The thickness of the cortex will determine the fineness or coarseness of the wool. The outer layer is called the epidermis or cuticle and is made up of tiny scale-like cells that point upward toward the tip of the hair. These little scales are what makes wool feel itchy. In this photo, you can see that some individual fibre have a medulla and others do not, and on the right, you can see the layers of scales that make up the cuticle. Different breeds of sheep produce different types of cuticles, which makes the fleeces feel itchier or rougher in some breeds. You can see the differences in these three illustrations. 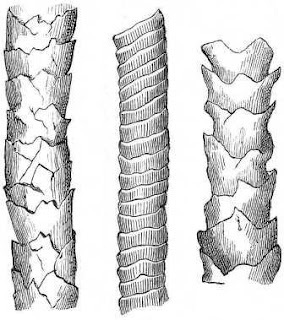 Starting at the left, the drawing with the small, low-laying scales would be from a fine, crimpy wool. The centre drawing, where the scales are broad and flat and appear to spiral up the hair, would be from a lustre longwool. The drawing to the right would be a coarser wool with larger scales that curve outward from the surface of the hair. All of these different scale structures give the specific fleeces of their breed very distinct characteristics, which I will discuss in another post. However, there are several characteristics that are common to all types of wool. The best known characteristic of wool, of course, is it's insulating property. Wool will retain warmth while allowing air exchange, which makes wool ideal for warm clothing in northern climates, as well as for quilt battings, insulation for homes and warm floor coverings. Any knitter can tell you, wool is very elastic. That is, it can be stretched, then return to its shape-up to 30% of its length in some cases! This means that wool garments will be cushy and crushable without creasing, as well as keeping their shape after washing and wearing. Wool's elasticity will also make a garment very durable. The fact that the fibres are elastic keeps them from breaking under tension or bending. Broken fibres are the source of most wear and tear in garments, including worn spots, pilling and tears. Wool is also hygroscopic--which means it will hold and conduct moisture. Wool can absorb up to 30% of it's weight in moisture before it feels wet, and moisture will be wicked away from your body if you perspire while wearing a wool garment. Wool is flame-retardant. It will burn when exposed to directly to flame, but will stop burning once the flame has been removed. The insulating characteristic of wool also makes it useful for smothering a flame by cutting off the oxygen, but I wouldn't recommend trying it because nothing stinks like scorched wool! Wool takes dyes well, and responds equally well to chemical and natural dyes, giving brilliant colors in most yarns. As well, wool comes in a wide variety of natural shades of brown and grey, giving an almost endless palette of earth-tones. On the downside, wool is prone to shrinkage under certain conditions. Abrupt changes in wash- water temperature, agitation, and extreme heat will cause the scales on the surface of the fibres to contract and the fabric will become denser and smaller. Fortunately, we know this will happen and can prevent it by gently washing our wool in lukewarm water and hanging it to dry. Or we can take advantage of this characteristic to make felt--which is loose wool compressed into a fabric by abrupt changes in wash-water temperature and agitation!